Be the first to share your favorite memory, photo or story of Roberta. This memorial page is dedicated for family, friends and future generations to celebrate the life of their loved one. Roberta Jackson Harness, 80, of Hamilton, OH passed away Tuesday, October 9th, at The Mercy Health Hospital in Fairfield. 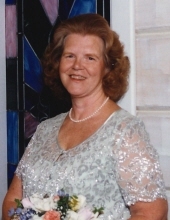 She was the wife of James Mitchell Harness whom she married on March 17, 1997. Roberta was born in the community of Broughtontown, in Lincoln County, KY on April 27, 1938. She was the daughter of the late Oscar and Elsie Gertrude (Hubbard) Jackson. Roberta had worked as a Manager for the Cincinnati Bell Telephone Co. for 27 years. She was a member of the Norwood Church of Christ and the Model A Club. Roberta loved to travel and see the world. Surivors Include her loving Husband, James Mitchell Harness of Hamilton, Ohio; Daughter, Kim Estep of Perryville, KY ;2 Sisters, Charlene Archer of Waynesburg and Sheila Long of Lexington; 2 Grandchildren: Robert Aaron Estep & Tonya Thompson; 4 Great Grandchildren: Madison Middleton, Kimberly Estep, Chelsie Taylor & Caden Thompson; 4 Step Children, Jean Frack of Florida, Danny Harness, Sandy Edmiston, and Bonita Hamilton all of Ohio; 9 Step Grandchildren & 13 Step Great Grandchildren and Many Nieces, Nephews, & Friends also survives. In addition to her parents, Roberta was preceded in death by Brothers, Lonnie, Gerald & Marvin Odell Jackson. To send flowers or a remembrance gift to the family of Roberta Jackson Harness, please visit our Tribute Store. "Email Address" would like to share the life celebration of Roberta Jackson Harness. Click on the "link" to go to share a favorite memory or leave a condolence message for the family.